Tomorrow, Keith McNally will open Augustine in the brand-new Beekman hotel. It is the 14th restaurant in an illustrious three-decade career from the restaurateur who has been credited with inventing downtown. 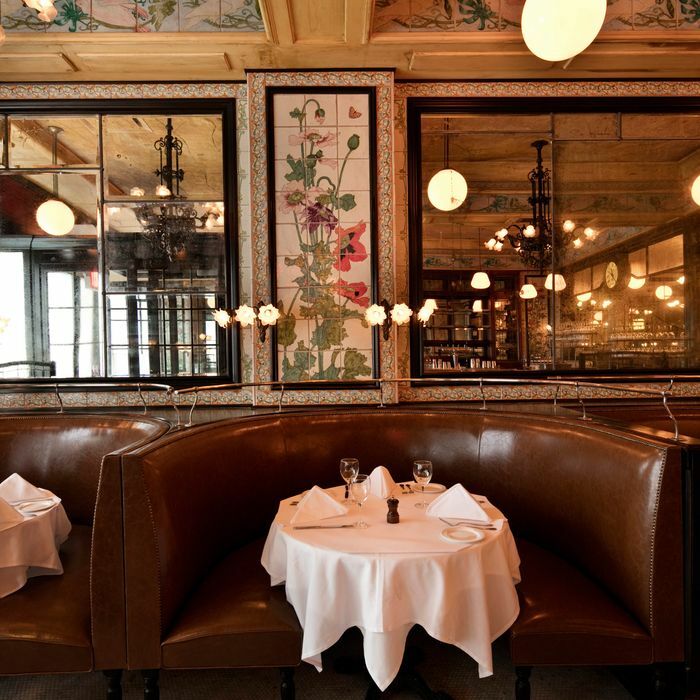 It’s also a very McNally restaurant: plush brown banquettes, an early-20th-century-French vibe, big mirrors, worn-in touches like forced watermarks. On the eve of the restaurant’s opening, McNally talked with Bloomberg’s Kate Krade, and wrote an op-ed for the New York Times about what to expect from Augustine, how the industry has changed, and his feelings about restaurants today. Here are the eight most interesting things from the man himself. Yes, he still hates opening restaurants: Keith McNally, as he made clear before, is the tortured artist of the New York restaurant scene. In the Times op-ed, which McNally opens by writing “in many ways I’m sick of restaurants,” he admits that all the headaches — critics, stifling rents, inevitable mistakes clashing with his perfectionism — have him vowing every time “never to open another restaurant.” He’s only really happy, he says, when the space is still a blank canvas of possibility. The Augustine burger was supposed to come with a shot of whiskey, but now it’s topped with whiskey onions instead: As he tells Bloomberg, McNally’s chefs Shane McBride and Daniel Parilla made him reconsider his plan to offer a shot of whiskey with the restaurant’s inevitable burger. It will still be called the Whisky Burger, but it will simply be topped with onions that are sautéed with Scotch. At Augustine, McNally started with the tiles: When he started conceiving the restaurant three years ago, the first thingw he thought about were the Art Nouveau tiles framing — what else? — mirrors. He went so far as to find a place in Italy that could make the tiles for him, and the process of getting them right took about two and a half years — longer than any other part of the restaurant. Was it a good investment? “Maybe it’s worth it,” he tells Bloomberg. He almost took as much time with the menus as he did with the tiles: They didn’t invest quite as much time in the food as the tiles, but McBride and Parilla worked on the menu for two years. They also went on a ten-day field to Europe so they could eat food and decide what to do. This whole project almost didn’t happen: McNally was first approached about the Beekman space by his buddy André Balazs, who was planning to take it over. When that fell through, though, the new owners approached McNally, as well, and a deal was eventually made. He agrees that smaller restaurateurs are being squeezed out of Manhattan: McNally has seen his rents rise dramatically during his career, and like everybody else, he realizes that Manhattan is just too expensive for independent restaurants. In the Times, he calls it “an incalculable loss to the life, in particular the creative life, of the city.” He also recognizes that in today’s New York he couldn’t pull off something like the Odeon, which he originally opened in a ungentrified Tribeca for $138,000. Even McNally is feeling California vibes these days, saying they’ll influence Pastis 2.0: The reboot of Pastis will commence in March 2017, when McNally will begin the rebuilding process. Don’t expect exactly the same restaurant, though. He recognizes that it was a different world when Pastis opened, and now he’s looking west. “I’d like the food to be different — lighter with a lot more grilled fish, and slightly more Californian,” he says.